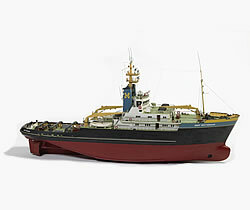 Billings Boats BIL478 Smit Rotterdam Ocean Tug 1/75 scale wood ship kit! Smit Rotterdam was built in 1975 for Smit International BV in Holland, and was at the time of its completion the largest and most powerful tugboat in the world – with a tonnage of 2,273 tons, a length of 75 m, a 22,000 HP engine and a top speed of 16.5 knots. The ship is built with bulb stern and stern nozzle; inboard equipment includes the most modern gear for navigation, steering and radio communication.